Finding the right balance was the focus of the Australian visit of international holistic farming expert Joshua Dukart from North Dakota, with more than 160 people attending his full day workshops as well as hearing him speak at Underground and during farm tours. Joshua is a certified educator of holistic management and an agricultural and Biosystems engineer. He develops grazing, cropping and cover cropping plans that enhance soil, plant, animal and human health. 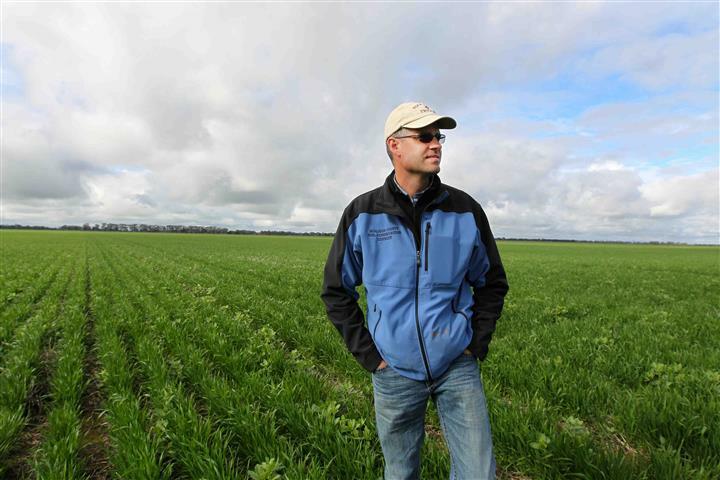 He shared his insights in an interview with Vic No-Till about managing your money, land, livestock, native vegetation, pastures, crops and people – the way farmers really want to. What is your first impression after spending a few days in Victoria and meeting local farmers? So far I’ve had the opportunity y to tour landscapes in this particular area of Victoria and what I’ve been impressed with is the openness of the farmers I’ve met to explore new ideas, to admit there’s things in the past they could have done better, but to their credit they’re exploring that and looking for ways to improve. It’s the primary term I use, not so much from a sales pitch standpoint but from a more descriptive standpoint. The word sustainable is thrown about a lot and I think it’s probably lost a little bit of its integrity and has become more of a marketing term than a descriptive term of management practices and land management. The term regenerative – whether you’re talking about finances, animal husbandry, family and community or farming practices – sticks with people. It’s a new term in some ways and yet it really goes back a long way in terms of its depth of what it really means. You just mentioned family and people and needing to consider so many different elements – what’s the first step for farmers coming to this regenerative concept in agriculture? It starts with where is your mind at? What are you open to? Where are your weaknesses, strengths? And not being afraid of either of those. The approach I take when I try and help families and businesses is look at things from holistic standpoint. Look at equipment, resources in terms of land or animals or crops and also looking at the financial part. And last but not least, we can’t leave out the people family component. When you put those three things together – the resources, the finances and the people – that’s when you are truly starting to a reach a holistic-type picture. The goal is not to maximise any one of those but to put all of those together into a package that everyone in the family or business buys into, then move that in the direction everyone agrees to move. Even if it moves slowly, that’s much better than moving quickly in directions we’re not sure about. With farmers that would be first thing get mind wrapped around. That is, where you want each of those scenarios to be. You then start formulating a bit of context around what scenario you want to live under, what goals you have then methodically start moving towards how to achieve that. How important are conferences like this? It’s extremely important to hear speakers, gain information and to network with others at various stages of their transition. Regenerative farming is much more than changing of piece of equipment and I see Vic No-Till is really looking and exploring that avenue. So it’s much more than being no till, it’s more of an intended outcome which is greater soil health, being able to produce more profit and being able to produce healthier food products for people and therefore improve human health – regenerative thinking ties all those things together. And conferences like this are great place to start because as well as the speakers; it allows networking to take place so when the conference is over relationships between people don’t stop. This is when the mentoring and friendships can happen, all and all everyone is better because they have someone to talk to about these things. What are the costs of regenerative farming vs benefits? Any time you make transition from one type of management to another there is some cost involved. But with regenerative type of agriculture, we need to look at the value of the entire system the whole situation because many of the benefits such as soil health are not as easily measured as something you can buy off a shelf and apply into a system. But the benefits are there, the value is there but human patience also has to be there to let these things play out. A system that has been engaged in a type of management for this length of time, and all of a sudden we’re going to change that – it’s just like you and I saying we’re going to change our job or change our living situation, that takes some time. The biology in our entire ecosystem, especially soil biology, needs some time to adjust to the new management system before it can start working at optimum level. But by making these changes and doing it at the pace that’s appropriate, we can make those costs come out and in long run so there should be a lower cost-lower risk-higher benefit type system available. So it’s not just planting covers, using a disc or putting in a strip for insects? There’s more to it than that? Any one of those things can provide benefit, they’re good practices, but I like to think of them as ‘tools’. What we need to understand about our own situation is that everyone is going to be unique – there will be similarities as well – but a lot of uniqueness for each individual. That’s where finding the right tools at the right time for the right situation and the right application becomes very important. That’s where the process of looking at things ‘holistically’ helps you identify what’s most important to you and the intended outcome. This framework gives you the right tools to use, the right questions to ask therefore helps you reference what that goal is and helps you make your way down that road to where you want to go. There’s no one tool that’s necessarily horrible or one that’s a cure-all or silver bullet, but it’s a matter of putting the tool into the right situation for you, your family, your operation. It’s all about the whole system, not about any one tool or any one practice. So it’s a ‘whole’ farming approach? A great example of regenerative farming comes from my personal life. My wife came from the city I came from the country. We had things we shared and had in common but one of the struggles we had was what are we going to do from a career standpoint? Not only where to live and raise children, but what are we going to do in careers that are purposeful and in service to ourselves and others? I came from the perspective of soil health and plant health which leads to animal health. She’s very passionate about human health, child development and community development, and added that element. She said how do you achieve a healthy population? You need healthy food, healthy plants healthy animals. So people come into that spectrum no matter which perspective you come from – it’s about understanding that all those things are connected. Putting that human health component at the end of it that really bought the people into this an understanding you can’t separate the people from the business part, and you certainly can’t separate it from the personal part. When you start looking at people – yes your family’s important but there’s a bigger family that are part of it, and that’s a community. In the US there are a lot of rural communities struggling; some of farmers have indicated the same is happening here in rural parts of Australia. This is when the term regenerative becomes really important because were not just looking at regenerating soils we’re looking at carrying that momentum all the way through the equation which ends with regenerating people, families and communities. I don’t think that’s talked about enough in farming conferences – I can talk about cover crops and soils and grazing and cropping, but I really get excited about the people part of things. The psychological part of things which enables us to really bring some ability to make some changes; and see agriculture in a totally different light to what we’ve maybe seen it before.